In another bold move for the tournament, yesterday’s news means the NI Open remains at the forefront of tournament golf in Europe, not only in the men’s game but now in the women’s game too. Every year the event has set record attendance figures on the European Challenge Tour with over 43,000 spectators coming through the gates in 2017 as Frenchman Robin Sciot-Siegrist lifted the trophy. Plans at this stage will see Massereene Golf Club used as the second host course alongside the NI Open’s perennial home at Galgorm Castle in Ballymena. Massereene is an established parkland in Antrim just 12 miles from Galgorm Castle. This week’s NI Open gets underway from Thursday (August 16-19) with the popular Pro-am to take place at Galgorm Castle today. Entry to the NI Open is free for all the family. Full details at NIOpen.golf. Gary Henry, Managing Director Galgorm Castle / NI Open Event Director is delighted with the latest news. “We have been working closely with our key partners for a number of years and as part of the ongoing planning process we try to introduce something new to the NI Open every year. “We have another great tournament lined up this week as we return to the 72-hole strokeplay format and have introduced the new show stage with live acts playing during tournament week. 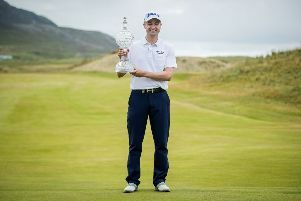 And Michael Hoey, NI Open Tournament Ambassador said: “Introducing a ladies’ tournament to the NI Open is a great move. “It is extremely forward thinking by everyone involved with the NI Open and will have far-reaching benefits beyond the golf tournament with additional bed nights and a boost to the local economy, while presenting greater opportunities for sponsors and partners. “The Vic Open in Australia has been hugely success and gained a lot of popularity and exposure and the vision for the 2019 NI Open promises to do the same. And Leona Maguire - Ladies PGA professional - said: “I am delighted to see the prospect of tournament golf in the ladies’ game return to Ireland. “The timing couldn’t be better for the likes of Lisa and myself, who turned professional earlier this year. We have been fortunate to play in a number of Ladies Irish Opens during our young amateur careers but there hasn’t been anything in place since 2012.